Applying evolution in the laboratory poses a fundamental problem: the experiments can take so long, researchers may turn gray waiting for results. The process rests on random mutations passed on during reproduction: beneficial mutations that improve fitness spread in subsequent generations, detrimental changes are pared. But even in fast-reproducing organisms, a round of laboratory evolution takes about a week. 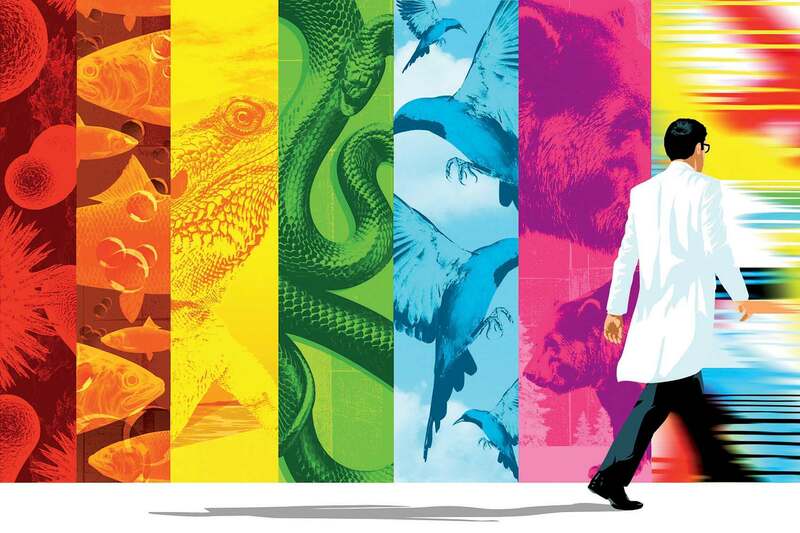 For “100 rounds of evolution, that’s two years,” says professor of chemistry and chemical biology David Liu. “If you need to do a thousand rounds, that’s two decades. It’s just not practical to set up experimental evolution on that time scale,” especially given the risk that an experiment might not work. Today a technique called PACE, developed in Liu’s lab in 2011 in an effort led by then-doctoral student Kevin Esvelt (see “Editing an End to Malaria? ,” May-June 2016, page 50), has cut the time required for this trial-and-error cycle more than a hundred times, allowing researchers to run experiments at a rate of a thousand rounds of evolution every six weeks. To reach this high velocity, the system uses as its backbone a virus that replicates with extraordinary speed: every 10 minutes. Scientists place the gene they want to rapidly evolve into the virus; at the end of the process, they can place the evolved gene back into the organism it came from, or into another species, such as a plant. The achievement has allowed researchers to tackle problems that would be impractical to solve using conventional evolution methods, from a fundamental question about evolution itself to an important problem facing modern agriculture. Viruses, which consist of genetic code in a protein capsule, reproduce by hijacking the machinery of cells. The virus and host combination at the heart of the PACE system (the acronym stands for phage-assisted continuous evolution) is filamentous bacteriophage, which infects E. coli cells. PACE forces the virus into a dependent relationship with the host cell. To engineer this dependency, researchers remove a piece of the viral genome critical to the virus’s survival and place it in the E. coli cell’s genome instead. Now the virus can’t survive unless the cell provides what it needs. At the same time, the researchers modify the host cell to produce what the virus needs only if the gene the researchers are forcing to evolve is increasingly active in the virus. What results is a biological machine for evolution that promotes the activity of the specific DNA sequence the researchers have introduced. In 2013, Liu’s team used PACE to tackle a basic science question posed by the late Agassiz professor of zoology Stephen Jay Gould. If the tape of life as it evolved on Earth could be rewound and run again, would it turn out the same way? In another example, Liu showed that a particular combination of mutations could set the stage for a dramatically beneficial mutation to occur that wouldn’t have been able to evolve without specific preconditions. “In other words,” he explains, “it’s the complicated, interwoven context of dependence—the reliance on past mutations to determine how future mutations increase or decrease fitness—that makes evolution, at least in the case we studied, so path-dependent and so irreproducible.” If the findings apply more broadly, then life on Earth might indeed have turned out very differently. In 2016, Ahmed Badran, one of Liu’s graduate students, used PACE to tackle a more down-to-earth problem—pest control. A favored method for controlling caterpillars that eat crops such as cotton, corn, and soybeans has been to engineer the plants to express a natural protein that kill insects but is harmless to humans and other animals. Called Bt, this protein is made by the common soil bacterium Bacillus thuringiensis and is also used as a spray in organic gardening. Bt works by binding to cells in the gut of the caterpillar and forming an open pore. This kills the cells and ultimately, the caterpillar. But over time, caterpillars have evolved resistance by decreasing the expression of the proteins on the surface of their gut cells to which Bt binds, or by mutating these gut cell proteins so they no longer engage Bt. Badran and Liu, in collaboration with scientists at Monsanto, wanted to see if they could evolve Bt to attach to a different gut protein. After 22 days of PACE, and about 500 generations—a decade’s work using conventional methods—they were able to restore the ability of evolved Bt to kill Bt-resistant insects. Monsanto is now using PACE to evolve Bt toxins that target a variety of resistant insect pests.